And so journalist and cultural critic Kate Bolick explores the history of single women of the past, and invites us to read into her own journey (with the help of five female 'awakeners' from the past) in understanding what it means to be unattached in the 21st Century. I think it's fair to say this book was not the book I expected it to be. 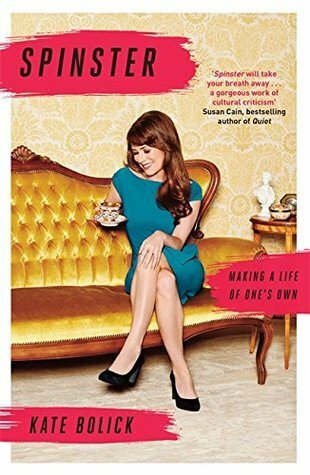 Bolick presents Spinster as part thought provoking account of single women in America and part emotional memoir of her time in and out of relationships throughout her 20s to her 40s (with an obvious major emphasis on being out of relationships). On the historical side, it's fascinating to see the history behind ideas on 'single-dom' and marriage. It's especially interesting to see these ideas presented through the lense of Bolick's five awakeners: Edna St. Vincent Millay, Maeve Brennan, Charlotte Perkins Gilman, Neith Boyce and Edith Wharton. The awakeners were five incredible women who dabbled in 'spinster-hood' for significant periods of their lives, and act like spirit guides for Bolick, all coming into play at various points in her life - which is where the memoir aspect of the book comes into play. Bolick's story is just as much present as these women, as she falls in and out of love, lives on her own, goes one meaningless and meaningful dates, and all the while asking the question: Why is being in or out of relationship such a big deal for a women? At this point I want to emphasise that the book is less about elevating the merits of single-dom and condemning marital life, but rather the book enforces the second half of the title: 'Making a life of one's own'. Spinster preaches the idea that a women's life should not be ruled by the timeline of when she should find a husband and start a family (but if that's what she decides what she wants to do that's fine too - in fact some of Kate's awakeners end up in fulfilling marital relationships). It's message that women deserve to be the sole agents in their own destiny, and shouldn't be judged for that, is inspiring and one that should be shouted from the rooftops. Bolick is a great narrator and through her voyage of discovery a reader too can find their own peace with following the path of solitude too.